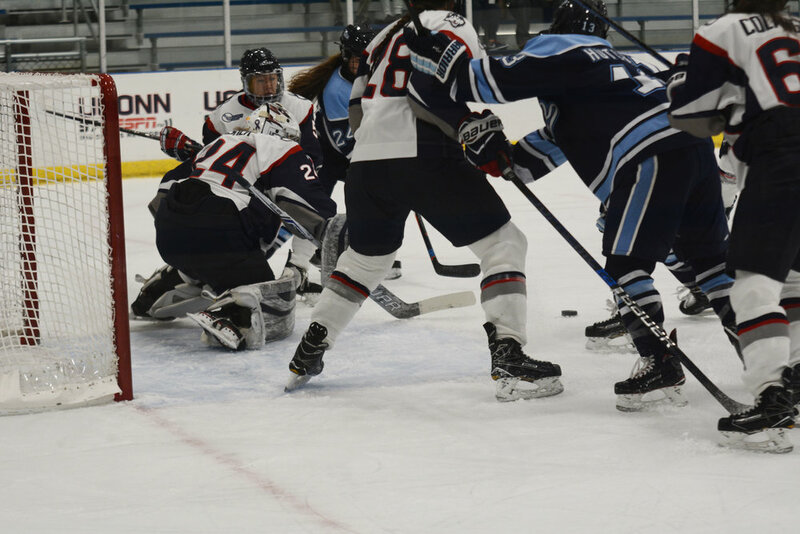 Morgan Fisher is a junior at UConn and the starting goalie on the women’s hockey team. She is having a great season in her first year as the starter with a save percentage of .923 and several games of 30-plus saves. The Vernon, Connecticut, native took some time last week to sit down with The Daily Campus so we could get to know her better. Danny Barletta: Coach Mackenzie was talking about your helmet, so what’s special about your goalie helmet? Morgan Fisher: We have had a Team IMPACT player on our team for the past couple of years, Ashley. She’s from my hometown, and I wanted to do something for her that would let her know that she’s with us on every practice, trip, game even when she can’t come. So I surprised her with that at the beginning of the season. DB: That’s awesome. So what’s on it? MF: We’re both nicknamed Fish from our parents, so I had her draw her favorite fish and I had that put on the back. DB: That’s really cool. What’s your major and why did you choose it? MF: I’m a sport management major in the School of Ed. I chose it because I want to keep sports close in my life. I’ve been around it since I was like three years old, so it’s something that’s familiar to me and I’d love to pursue more in the future. DB: What’s it like being the only Connecticut native on the team? MF: It’s kind of weird having all these Canadians on our team. It’s kind of cool to have an outside perspective, but it’s also nice to have a home crowd every time you’re playing, so I don’t have to go too far to get that family here. DB: Was being from Connecticut the main thing that brought you to UConn? MF: Yeah, Connecticut has been my dream school since I was growing up, so to even get looked at by UConn was a dream come true in itself. DB: When did you start playing hockey? MF: Around four years old was when I learned how to skate. I played boys hockey all growing up and then switched over around middle school to girls hockey. DB: Were you always a goalie? MF: I played one year of defense and was terrible at it. Every week our coaches switched out who would play goalie and the one week I got to play was when goalie stuck with me forever. DB: What made you want to become a goalie? MF: Like I said before, I was really bad at all the other positions. I did not know what I was doing on the ice and goalie just felt natural to me when I tried it. DB: If you could play another sport besides hockey, what would it be? MF: Probably softball, because I was a catcher in softball as well during high school. It’s a pretty similar position. DB: Who’s your favorite professional athlete? MF: Probably right now Baker Mayfield. His mentality is something that I strive to have. DB: What’s your favorite professional sports team? MF: I’m a diehard Philadelphia Eagles fan. Kind of weird from Connecticut, but it was awesome to have them win the Super Bowl last year. DB: What’s your favorite class you’ve taken at UConn? MF: Probably, not because it was easy, but Public Speaking. It was really hard but it had a lot of transferable skills in it so it helped me out a lot outside of the grade aspect. DB: What’s your favorite place to eat around campus? MF: Probably Gansett. Always can go there for a solid wrap. DB: Do you have any pre-game rituals? MF: I always tape my stick. I’m always the first one with the soccer ball before. We always play a game of soccer before, so it’s usually me and my goalie partner that are out there first. That’s pretty much it. DB: What’s your favorite musical artist? MF: That’s a tough one. I listen to Migos before every game. I listen to Culture II before every single game. DB: What’s your favorite TV show? MF: I don’t watch a lot of TV but my all-time favorite is Family Matters. DB: Since we’re going into the Christmas season, what’s your favorite Christmas song? MF: Probably “All I Want for Christmas,” the Mariah Carey/Justin Bieber version. MF: Home Alone. All of them. Love them. DB: What’s your favorite UConn hockey memory? MF: Probably last year, knocking off Providence in the playoffs and also BC in the semi-finals to go to the finals. DB: What’s your favorite fast food? DB: Favorite Dairy Bar flavor? MF: Husky Tracks, all the way. DB: What team do you consider to be UConn’s biggest rival? MF: Honestly we love playing BC. It’s just a huge rivalry every time. MF: I have to say Twitter. It’s pretty entertaining. DB: Finally, what do you believe is this team’s biggest strength? MF: Our sense of family and culture. We’re such a tight-knit family. I don’t think any team can match us in that aspect. Danny Barletta is a campus correspondent for The Daily Campus. He can be reached via email at daniel.barletta@uconn.edu.